As the end of the semester comes to a close, graduation slowly approaches for seniors. This also means their capstones are being completed. These capstones demonstrate what the student has found after conducting research on a topic related to what they are studying. Some fourth year medical students like Madison Kommor go the extra mile. “I have devoted four years of my life training to become a physician, thus that should take priority,” said Kommor. But for him, the exciting thing about studying Emergency Medicine is the ability to pursue passions outside of clinical medicine. “I currently have a passion for Disaster Medicine education for medical students, and it was this focus that got me into creating the Disaster Medicine Certificate Series (DMCS),” said Kommor. Students in the DMCS have been training all year on various topics to prepare for an active shooter scenario. The drill, which took about eight months to plan, happened March 30 at the Health Science Campus. It consisted of over 70 participants and included two IED explosive detonations and two shooters carrying AK-47s loaded with blank rounds. Kommor described how the active shooter drill was chosen over a natural disaster for various reasons. 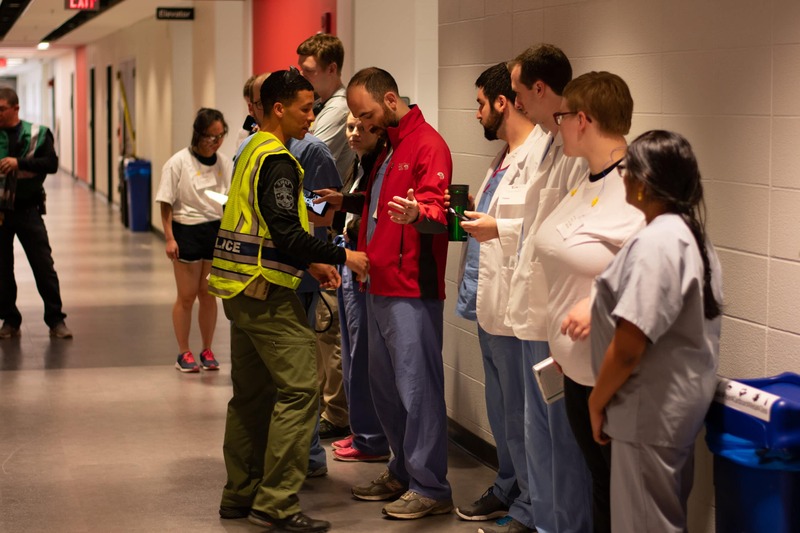 “I think medical students especially are sick and tired of sitting in the library, getting notifications on their phones of yet another mass shooting, and not being able to do anything about it,” he said. Kommor and his team worked with 11 different local, state and federal agencies. “Perhaps the single most difficult thing about planning a drill of this caliber was getting all the agencies to the table,” said Kommor. When the drill actually happened Kommor was all over the place. “I was surprisingly calm when the simulated IED explosions went off, but that calm quickly vanished after I heard the booming assault rifles in the courtyard,” he said. Even having planned this drill down to the tiniest of detail, for Kommor, the entire experience was surreal. Watching medical students triage and treat victims portrayed by actors gave Kommor a great sense of pride too. This drill was one of the first large-scale drills Kommor had led and planned. He said this wouldn’t have happened without the help. Kommor’s advice to seniors planning out their capstone projects for next year: make sure you truly love your project and if you’re going to do it, go big. “Rock the boat and make the people around you take a look at all the work you put in. Your project needs to excite you enough that you are willing to spend your free time doing everything you can to make it great and worthwhile,” said Kommor. After graduation, Kommor plans to go to Ohio State University to complete his three-year Emergency Medicine Residency.